Forever Darling is one of those geriatric MGM shows from the fifties where it seemed like pre-war business as usual. You’d think Louis B. Mayer was still in charge. The story had been developed for Tracy and Hepburn. Grafting this onto Lucy and Desi wasn’t a bad idea in itself, but the thing is hopelessly old-fashioned, and more than a little reminiscent of comedies like Two-Faced Woman and Her Cardboard Lover, themselves dismissed (way) back in 1942 for being out of step with the times. 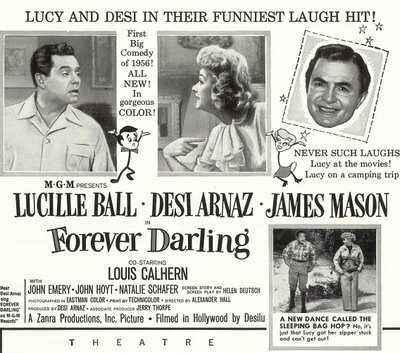 Forever, Darling is less traumatic than The Long, Long Trailer, but audiences didn’t like it as much, and red ink spilled put paid to any notion of more Lucy/Desi features. Prospects of L&D as typical MGM couple on a soundstage House Beautiful is at best unsettling --- and must Louis Calhern play Lucy’s father? We’re more accustomed to seeing this couple on TV amidst cardboard sets with plywood furniture. Now Lucy’s playing an heiress and newlywed (marrying a little late judging by appearance), and Calhern’s going along as if he’s still Dad to Jane Powell and Liz Taylor. On-screen marital misunderstandings forecast a coming real-life Arnaz divorce, and you wonder how accurately these scenes reflect what was going on at home (Lucy later acknowledged things were indeed very bad during this period). 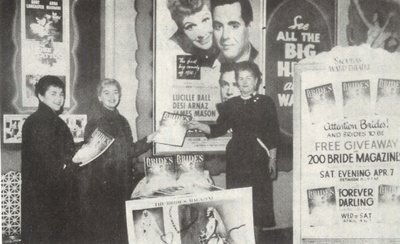 Audiences wouldn’t have been hep to that in 1956, when Lucy and Desi were still being sold as perfect show-biz couple. We do get a glimpse of Lucy’s strident and bossy off-screen persona as revealed by latter-day bios. 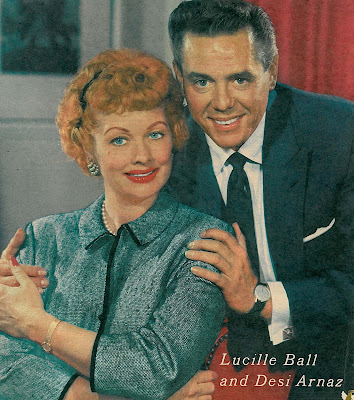 The final third plays like a short subject tacked on when somebody realized there were I Love Lucy fans that needed to be catered to, and slapsticking here is completely out of whack with what has gone before. The trailer and much of the ad campaign was built around this camp-out disaster, wherein the middle-aged couple plunge repeatedly into a muddy and all too convincing Yosemite Park mosquito pond. Again, I know my complaint is a product of age. Kids could probably watch this and howl. I just sat there thinking about a mid-forties Lucy having to do this stuff, and how miserably uncomfortable she must have been. 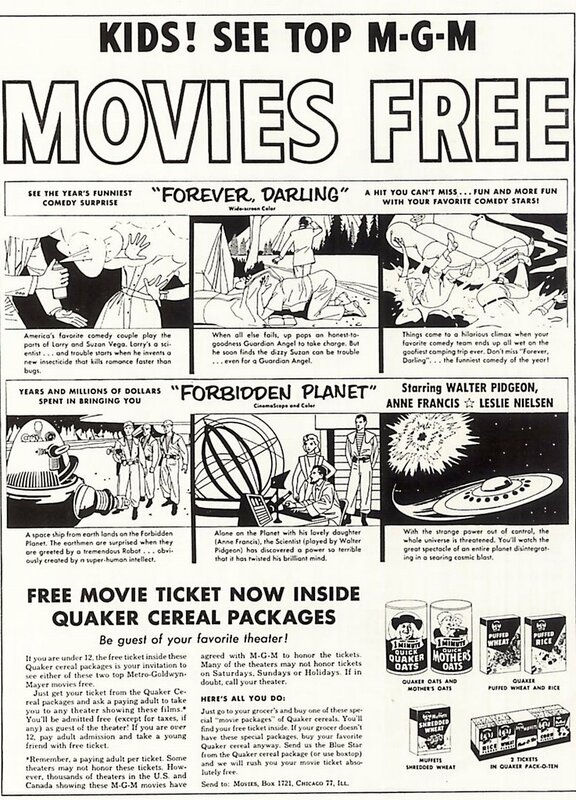 Don’t know whose idea it was to put movie passes inside cereal boxes, but MGM and Quaker Oats ran with it for two of the studio’s major 1956 releases --- Forever Darling and Forbidden Planet. Kids under twelve would be admitted free upon presentation of tickets found inside Quaker Puffed Rice, Shredded Wheat, Oatmeal Mix --- sixty million ducats stuffed in as many Quaker boxes. As between MGM and the cereal company, no monies were exchanged. One hand washed the other. Fifty-seven theatre circuit heads agreed to honor the tickets. Small exhibitors not in on the initial deal were free to reject the passes … at their peril. Breakfast food promotionals were recognized attention getters among kids. The tickets started going into boxes on December 27 1955. 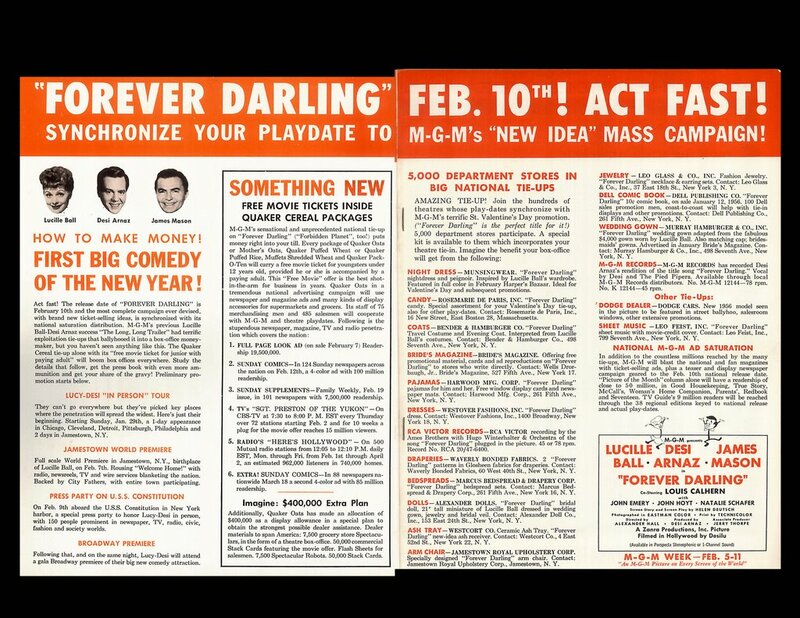 Forever Darling would be released February 10 1956, and Forbidden Planet would follow on March 30. The circuit guys hedged their bets by requiring lucky youngsters to be accompanied by an adult, which assured at least one ticket sale. Quaker had 75 merchandising men and 485 salespeople assigned to the project. Their job was to get displays into every grocery store and super market. I wonder what it must have been like to work for Quaker back in 1956. On the one hand, it would have been neat putting up colorful standees promoting free Forever Darling and Forbidden Planet tickets in all those stores. The flip side, of course, would be district and regional Quaker managers with clapboards and quotas, forever second guessing me and tattling to headquarters (especially about those Robby The Robot standees disappearing into the trunk of my car). Desi was at all times a snappy dresser. 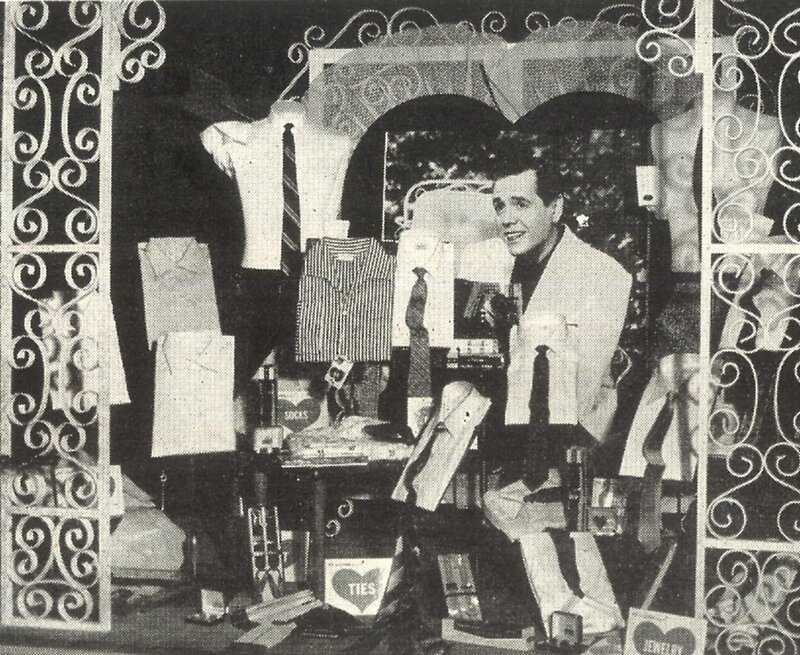 Guy had an incredible fashion sense as far as I’m concerned, so it’s no surprise to see him in the window of Bigelow’s Department Store during the movie’s opening week in Jamestown, New York (Lucy's hometown). Bride’s Magazine tied-in with Forever Darling for a Valentine’s Day promotion --- here’s an exhibitor handing out complimentary copies in the lobby. 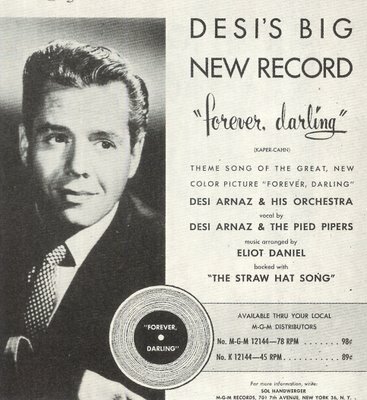 Desi cut a platter of his title song rendition for MGM Records, and appeared on What’s My Line, as well as The Ed Sullivan Show with Lucy. 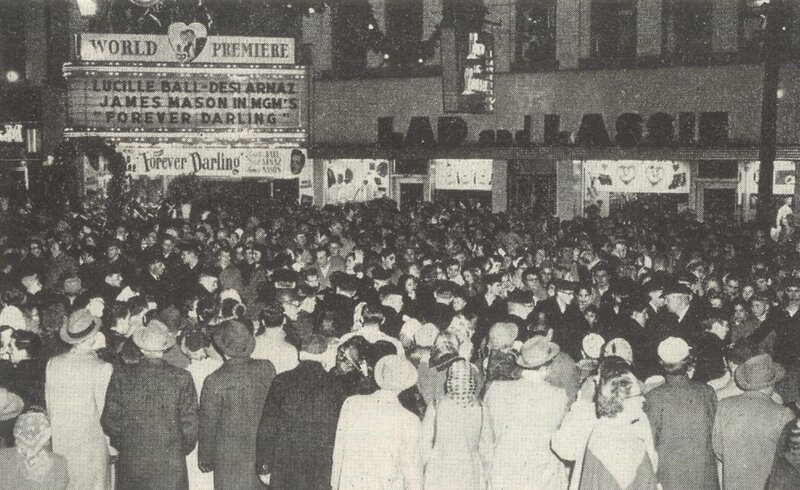 Mobs surrounding the theatre marquee are awaiting the world premiere and "Welcome Home" celebration that was held for Lucy when she and Desi arrived. Schools let out for a day, and Youngstown's entire population of 40,000 jammed streets for this two-day event. It was the biggest thing they'd ever experienced. I’ll bet you could go there today and ask anybody sixty or older and they’d still be able to tell you all about it. 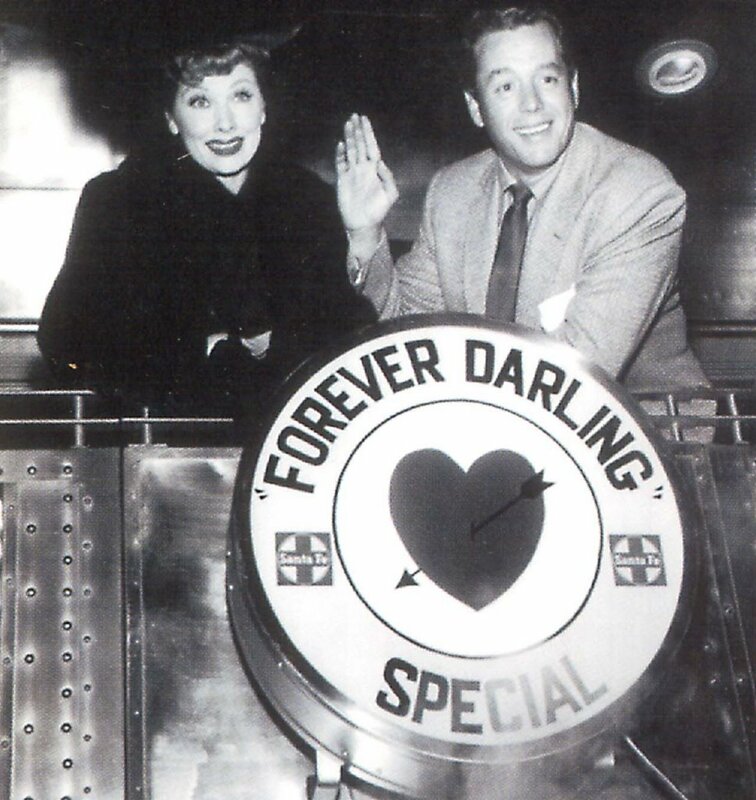 For all this showmanship effort, however, Forever Darling failed to find an audience. Even with a modest negative cost of $951,000, there was not enough in domestic rentals of just $1.9 million (plus $485,000 foreign) to insure a profit. The final loss stood at $158,000. I haven't seen FOREVER, DARLING in many years, but I've always wondered about the circumstances of its production. THE LONG, LONG TRAILER is a Metro picture all the way -- Pan Berman producing, Minnelli directing, plenty of studio gloss (albeit slightly marred by Ansco color). DARLING, however, is a "Zanra" production -- spell that backwards -- and the ads specifically note it was "filmed in Hollywood by Desilu." Desi produced the movie; Desilu's Jerry Thorpe was associate producer. 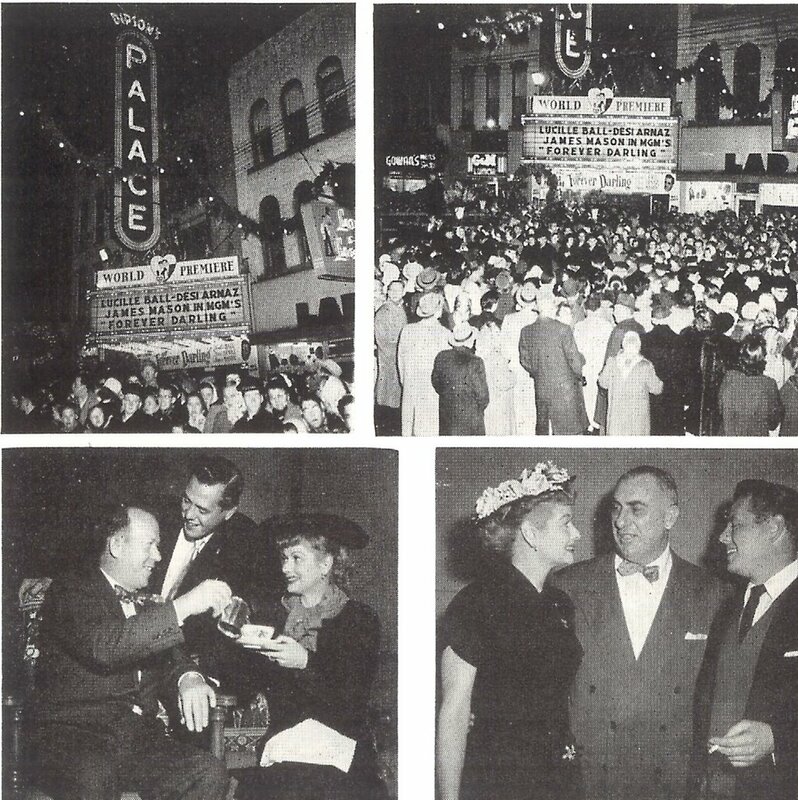 There's a modest, almost stripped- down look to much of it; this could have been shot at Desilu's stages. [As there's no credit for Metro chief art director Cedric Gibbons on the picture, it probably was.] "I Love Lucy" stalwarts Dann Cahn and Bud Molin are the editors. I'm guessing that Lucy and Desi made this on their own for Metro release -- they were already successful tv moguls, after all. MGM probably contributed the script, Bronislau Kaper's musical services and Calhern. I wonder whether Metro financed the picture; the studio did wind up owning it. Does the new dvd release have any background on the film's production? As I recall reading, James Mason really hated this movie... and had to be seriously coaxed into playing Mr. Jordan in Warren Beatty's Heaven Can Wait, because of his lousy experience as an angel in Forever Darling. 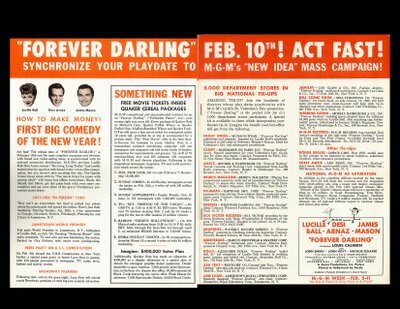 Hey John--I was one of the lucky kids back in 1956 to pull a theatre pass for "Forever Darling" out of my box of Quaker cereal. The only thing I wondered--what is THAT about? Unless it was either cartoons or cowboys, I was clueless back then about other types of movies--but I did use that pass at my neighborhood movie palace--and seeing the movie then still didn't get it for me---but the cartoons and shorts before the feature made it very worthwhile--saved me 25 cents cost of a kids admission!